On Friday, 7th December 2018, the most wonderful time of the year starts in Ghent officially: the time of the year when twinkling decorative lights bring some respite from the incessant darkness and the sound of Jingle Bells on loop in shops threatens to drive us all insane. Or at least reach for the nearest mug of glühwein. Amidst the crazy shopping marathon we submit ourselves to in order to buy all those Christmas presents just in time to catch our flight home for the holiday break, it is good to take a breath and enjoy the nicer things in life. While Christmas markets in Belgium are not exactly the traditional, romantic affair that we know and love from Germany and Austria, Ghent has been doing its best to catch up with the best over the past few years. So put on your warmest boots, hat and mittens and head out to town to explore the Christmas magic of Ghent! While Ghent seems to fall asleep in November, in December things really get going. Besides the Gentse Winterfeesten (7th December to 6th January) which combine the Christmas Market and other seasonal events, there are also other activities going on. For those who like to shop in crowds, the shops in the city centre are open on all Sundays in December, including Christmas Eve. Plus, you can ride the tram or bus for free on Sunday shopping days. If you want to get ahead of the game, pick up some handmade presents at one of the small crafts markets happening around Ghent: for example, CVO Gent hosts a HobbyMarkt with local sellers of crafts, hobbies and creative activities on the 8th December. If you don’t feel like joining in the consumerism, the mid-winter night run on the 8th December and the charity run Warmathon on the 22nd December (sold out!) are a good way to explore the edges of the city centre while doing something for your health and the society. Warmarathon is part of De Warmste Week (The Warmest Week), run by the Stubru radio station, which encourages people to organise events in support of recognised charities. Or warm up your vocal chords for the Allez Chantez sing-a-long event at the Gravensteen castle on the evening of 14h December. A slightly lower-key way of enjoying the night-time lights is the historical light walk around the city centre. Pick up your map at the city tourist office or online. Or join the annual Ghent by Night walking trail by the local hiking club Florastappers. Choose between 6, 9 or 12 km long walks through the magical streets of the city centre (1.50eur per person, pay on the spot). The Ghent Christmas market has been growing steadily in recent years and this year more than 140 wooden stalls will be scattered around the historical city centre between Sint-Baafsplein and Sint-Veerleplein. Many of them offer little trinkets that can help you out as a decent last-minute present, while you can also enjoy a variety of food from all over Europe and a healthy supply of fast food and mulled wine. This year Sint-Veerleplein, in front of the Gravensteen castle, has a 1920’s theme including a covered terrace where you can have a drink. There are also food trucks during the middle two weeks of the festival. Korenmarkt has always been the place to go for funfair-type of fun rides. 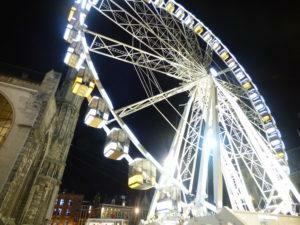 Think candy floss, merry-go-rounds and the amazing Roue de Paris. This Ferris wheel whisks you up in one of its pods to almost 60m above the ground and is a predictable favourite with couples and families. The Christmas market is open on most days between 11am and midnight, and until 5pm on 24th and 31st December. If you are looking for a perfect spot to get some exercise and have a break from eating and drinking too much, the ice rink under the Stadshal has definitely become a favourite. It is divided into two zones, the larger one (600m2) for those who are comfortable with narrow slits of steel instead of shoes on their feet, and one for beginners who are only getting acquainted with the slippery wonders of ice skating. The ice rink will be surrounded by trees this year to prevent the ice from melting too fast. You can rent skates at the entrance to the rink, or use your own. Those with a De Lijn pass or a special voucher that you can pick up from a De Lijn shop get a 2 EUR discount. The offer is limited to the first 3,000 participants. The transformation of this usually foreboding looking, stone castle at Christmas is incredible: expect fluffy pillows in warm colours, Christmas decorations and lights. Candles, a fire in the grate and some cleverly set up rooms make this normally cold place look positively homely. This year the theme of the Winterwonderkasteel will be the Viking threat to Gravensteen and how a king tried saving his castle from the fierce Norsemen. You can enjoy the festive attire of the Castle of the Counts from 15th December until 6th January, for a price of a simple entry ticket. On the opening night (14/12), when Allez Chantez takes over the inner courtyard, the entry to the castle is free. During the Winterwonderkasteel festival, the castle stays open until 10pm on Fridays, Saturdays and during the Christmas school holidays. You should definitely go and climb up to the top of the castle tower for an amazing view over the sparkling lights of the winter Ghent festivities. For people in difficult financial situation the Fonds Vrijetijdsparticipatie is offering tickets at a special price of 2 euro per person. Contact them for details on how to obtain this ticket. The opening act of the Winter Festival is the figure skating troupe Kryos. Catch them on ice under the Schapenstal at 7pm on Friday, 7th December. On the 23rd December catch the marching geese parading through the town to a tune of jolly music. The act, apparently known as being very animal friendly, includes musically inclined geese and their two musician handlers. If Christmas markets and boisterous holiday cheer are not your thing, head over to the Zebrastraat for the Zebrawoods winter festival (27th December to 6th January). The 10-day pop-up event brings a winter forest to the courtyard of the venue close by Kinepolis and promises to showcase an interesting mix of local music talent. While enjoying the concerts, you can have “steamy drinks” and hearty winter food. At precisely midnight on 31st December the annual New Year’s fireworks light up the city centre from Portus Ganda. To be honest, you need to love extremely crowded places and not mind poor visibility to enjoy this, but if you or someone you know lives in a place with a good view towards that side of Ghent, the spectacle will be worth watching.